From top to bottom: Ye Olde Stocks and the Redesdale Town Hall on the High Street; St. David's Church in Old Town; Paxford Racecourse; Batsford Arboretum; the Four Shire Stone; Batsford Manor and Park. The town stands at the crossroads of the Fosse Way Roman road (now the A429) and the A44. It is served by Moreton-in-Marsh railway station on the Cotswold Line. It is relatively flat and low-lying compared with the surrounding Cotswold Hills. The River Evenlode rises near Batsford, runs around the edge of Moreton and meanders towards Oxford, where it flows into the Thames just east of Eynsham. Moreton-in-Marsh railway station on the Cotswold Line. Moreton is derived from Old English which means "Farmstead on the Moor" and "in Marsh" is from henne and mersh meaning a marsh used by birds such as moorhens. An alternative suggestion is that 'Marsh' is a corruption of 'March', early English for boundary. A settlement was built during the British Iron Age just northwest of the town centre near the cricket ground. Archaeological research has found Roman pottery and coins at the site showing it remained occupied after the Roman invasion of Britain. During this period, the Fosse Way, one of the best preserved Roman routes in Britain, was constructed. It was initially constructed by the Roman army but was subsequently maintained by the local Civitas. The course can be traced through the county by the modern roads that tend to follow its course, although there are deviations such as south of the town where it crosses the hill into Stow-on-the-Wold. Moreton, is first mentioned as a Saxon settlement, around 577 AD. Following the Norman conquest of Britain, the township was part of the monastic property held by Westminster Abbey in London. Abbott Richard of Barking, began developing Moreton as a medieval market town between 1222 and 1246. The new town was built on common land bordering the Fosse Way to the northwest of the original Saxon settlement. An area that is still referred to as the "Old Town". To accommodate medieval markets, the new town has a long, wide High Street. The Church of England parish church of Saint David began as a chapel of ease for Blockley, to which the residents of Moreton had to transport their dead for burial. The early history of the church in Moreton is not clear, but there is evidence that a primitive Celtic place of worship preceded the church on the present site, which had seven springs. The church at Moreton came under the jurisdiction of the Batsford Estate, when that estate was given to the Bishops of Worcester in the 12th century. Latterly, the church in Moreton was a chapel-at-ease for Batsford, which was technically the parish church. The appointment of the vicar for Batsford with Moreton alternates between the Bishop of Gloucester and the Lord of the Manor at Batsford, currently Lord Dulverton, who, until the Second World War, exercised his right to collect a shilling (5 pence) a year for every shop window facing Moreton High Street. There is a tradition that the church was rebuilt and reconsecrated in the middle of the 16th century. The nave was enlarged in 1790, with a £1,000 gift from Samuel Wilson Warneford, most of the church was rebuilt in 1858 and the tower was replaced in 1860. The chancel and south aisle were enlarged in 1892 and the east end of the south aisle has been used as a chapel since 1927. A nonconformist congregation started meeting in Moreton in 1796, was constituted as a Congregational church in 1801 and had a chapel built in 1817. In 1860–61 the Congregationalists replaced the chapel with a new one on the same site in a mixed neo-Grecian and Romanesque style. The Stratford and Moreton Tramway was built between 1821 and 1826, linking Moreton with the Stratford-on-Avon Canal at Stratford. It was horse-drawn until 1859, when the section between Moreton and Shipston-on-Stour was converted to a branch line railway operated with steam locomotives. The Oxford, Worcester and Wolverhampton Railway, built between 1845 and 1851, passes through Moreton. The railway station was opened in 1853. The Great Western Railway (GWR) took over the OW&W Railway in 1862 and the Shipston-on-Stour branch in 1868. The GWR withdrew passenger trains from the branch in 1929 and British Railways withdrew freight traffic and closed it in 1960. The OW&W Railway is now part of the Cotswold line. The line between Oxford (Wolverton Junction) and Worcester (Norton Junction) was singled, except for the distance between Shipton-under-Wychwood to Moreton-in-Marsh, in the 1970s. The double track has been replaced, except between Evesham and Worcester (Norton Junction) in 2011, and freight services are planned to re-use this route. The town was known as "Moreton-in-the-Marsh" into the early 20th century. The name was changed to "Moreton-in-Marsh" before 1930. In 1940, a large area of level land east of the town was developed as RAF Moreton-in-Marsh and used by Wellington bombers. The former airfield is now the Fire Service College where senior fire officers from brigades all over the UK undergo operational, management and leadership training. The same complex is also now the headquarters of the Institution of Fire Engineers, the professional body for fire fighters, officers and civilians with an interest in fire engineering. The last time Moreton was badly flooded was in 2007. The floods, which blocked the High Street, were fairly regular in the 1950s and 1960s, until works were carried out on the ditches around the town. These works resolved most of the problems. Moreton was once the headquarters of the railway spot-hire company Cotswold Rail. Each September the town hosts the UK's largest one-day agricultural show. Held on part of the Batsford Estate, the show has been running since 1949. An electoral ward in the same name exists. The area and population of this ward are identical to that of the parish. William Towns (1936-1993), 20th Century car designer. ^ a b "Bleinheim Farm, Moreton-in-Marsh" (PDF). Cotswold Archaeological Trust. Retrieved 23 April 2018. ^ Bartholemew, John (1922). The Times Survey Atlas of the World. The Times. p. plate 18. ^ Encyclopædia Britannica, vol. 25 "Atlas". 1953. p. 16. ^ One-Inch Map of England & Wales. Cheltenham and Evesham. Ordnance Survey. 1930. Elrington, C.R., ed. (1965). Victoria County History: A History of the County of Gloucester, Volume 6. pp. 24–250. Verey, David (1970). The Buildings of England: Gloucestershire: The Cotswolds. Harmondsworth: Penguin Books. pp. 323–326. ISBN 0-14-071040-X. 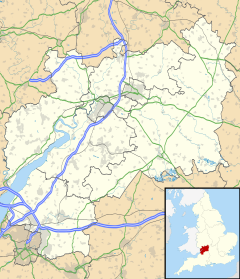 Wikimedia Commons has media related to Moreton-in-Marsh. Wikivoyage has a travel guide for Moreton-in-Marsh.